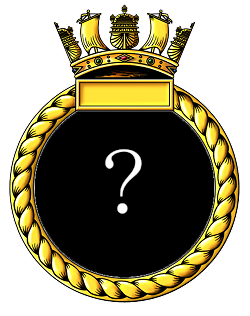 There is no record of a badge being approved or created for this ship. There is no record of a pennant number being allocated to this ship. 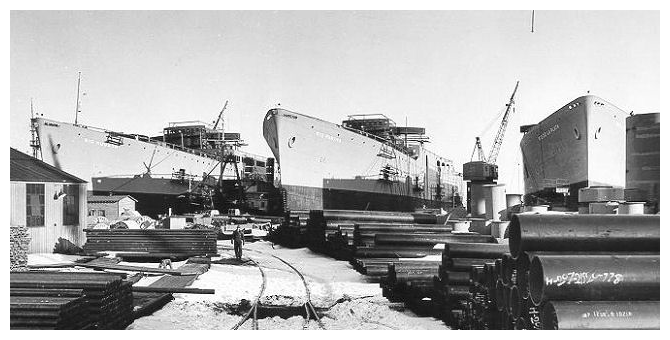 Shipbuilding & Drydock Company, Virginia. working up in the US. Formerly BAVG 4 , the USS CHARGER in Chesapeake Bay where she was to conduct deck landing training operations to training US Navy and Fleet Air Arm squadrons working up in the USA. 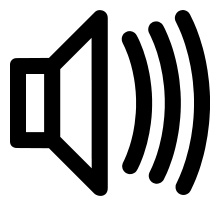 CHARGER was originally laid down at the yard of the Sun Shipbuilding & Dry Dock Company, Chester Pennsylvania, on March 14th 1940 as a 9,100 ton C3 type passenger-cargo vessel the RIO DE LA PLATA. She was Maritime Commission hull number 61, Sun number 188; One of four sister ships of the “Rio” class, RIO HUDSON, RIO PARANA, RIO DE LA PLATA, RIO DE JANEIRO ordered from the Sun Shipbuilding & Dry Dock Company for the US operator Moore-McCormack Lines to operate on the lines South American routes. The “Rio” ships had 17,500 tons loaded displacement, and loaded draft of 27 feet 4 inches. Each ship was designed to accommodate 196 passengers and have 440,000 bales cubic feet cargo space, including 40,000 cubic feet for refrigerated cargo. The RIO DE LA PLATA was launched on March 1st 1941 and christened by her sponsor Madame Felipe Espil, wife of the Argentine Ambassador to the United States. 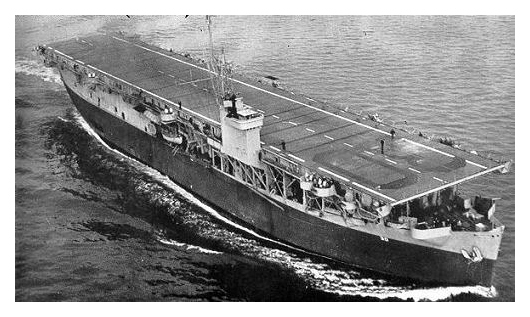 All four “Rio” ships were to be purchased by the US Navy for conversion into a modified 'Long Island' class Auxiliary Aircraft Carrier for transfer to the United Kingdom on loan; RIO DE LA PLATA was requisitioned on May 20th 1941 while still fitting out, and was delivered 80% complete to the US Navy on October 2nd 1941 at the Newport News Shipbuilding and Drydock Company, Virginia to begin conversion. The RIO DE LA PLATA was to be HMS CHARGER, BAVG-4. Her conversion consisted of installing a lightweight wooden flight deck on a truss work superstructure which covered 70% of the ships' length, fitting a small enclosed hangar beneath the aft of the flight deck to be serviced by a single lift. CHARGER, like her sister ship BITER had a small island superstructure fitted. On October 2nd 1941 Lt. Cdr (E) R.F. McArt RNR was present at the Newport News Shipbuilding and Drydock Company yard to as the RN officer in Charge. 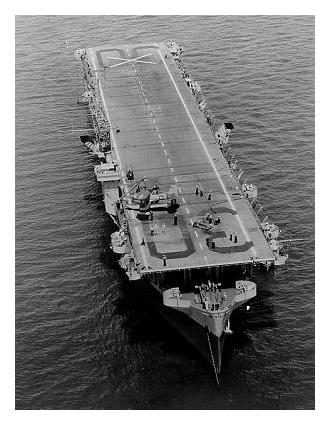 Two days later on October 4th the ship was s returned to US Navy charge after a decision had been taken for the US navy to retain her for service as a training carrier for both US Navy and Fleet Air Arm squadrons working up in the USA. She was reclassified from BAVG 4 to AVG 30 on 24 Jan 1942; she was the only BAVG to be reclassified to the US AVG designation. She commissioned into US Naval service on March 3rd 1942 as USS CHARGER. The USS CHARGER operated off the East coast of the United states as a deck landing training carrier, and her services were used by many of the Fleet Air Arm squadrons that formed, and worked-up, at US Naval Air Stations on the US East coast. a question--was the Charger ever involved in a ramming incident with a US destroyer during WW2-perhaps in 1943--perhaps in Norfolk Va. harbor?